Best Designs: Also See the New Sukup Slide Show! 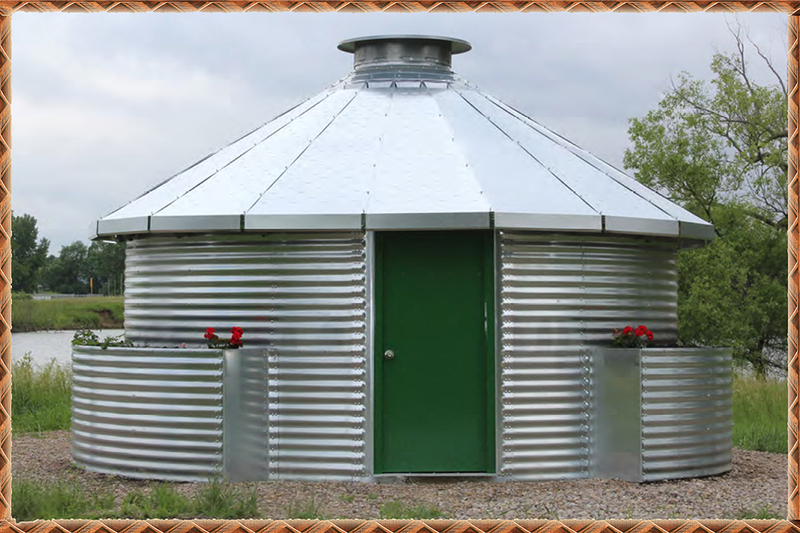 My partner and I have the exclusives for Hawaii on this round steel home fashioned after a grain bin. Sukup (pronounced sook up) sold many of them to help with disaster relief housing for Haiti, so it is a war tested and proven system. 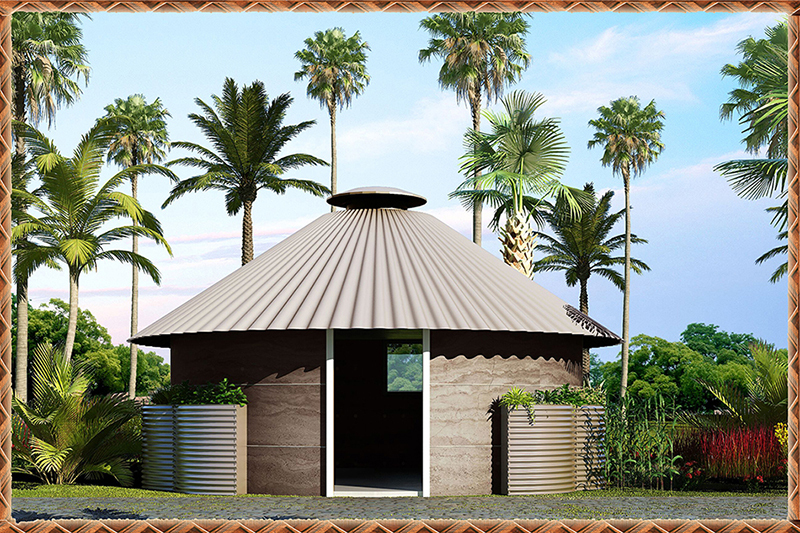 Although a round structure is far from ideal, it is one tough home, and it is the lowest cost, fastest built legal dwelling available in Hawaii as far as we can see. Sukup has only one model presently, they plan on offering larger ones in the future once they see enough return on their considerable investment designing and tooling this one. The present and only model is 18' in diameter, which equals approx 375 sq ft, when you include the loft, which comes with the kit. Not exactly a sprawling mansion, but for those wanting quick, durable and low cost shelter on their affordable lot in Puna, it fits the bill perfectly. This home is super fast to put up, and we plan on getting it pre-approved, just like our all-steel Modular Homes. Those plans are at the Kona bldg dept as I type. 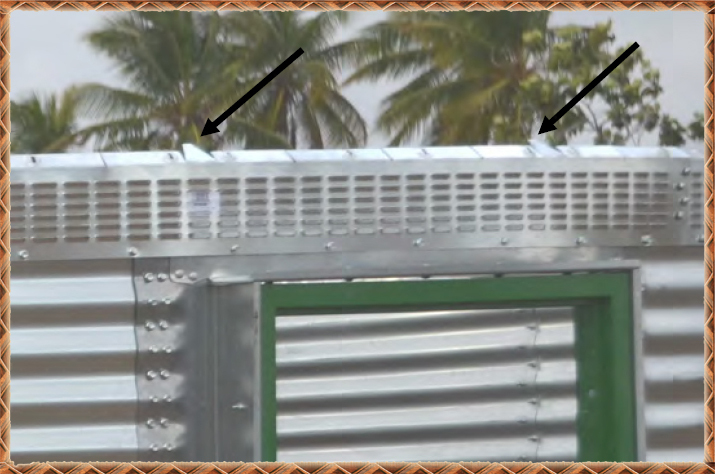 Kelly Wilson, who is in charge of the dept really loves this product, and asked us to share it with the affordable housing committee on Hawaii Island, which we are in the process of doing right now. He also liked the Sukup house. Pre-approved means you can get a permit to build in less than 2 weeks so long as your septic plans and site map are done. Our septic engineer gets ours done fast, and at a low price. It is a galvanized steel home with a door and 2 windows that you can't see on the front photo below, and even though it has incredible ventilation straight out the top, and all along where the roof meets the top of the round walls, it needs some heat reflection if it will be in the direct sun, and we have just the answer! Spray all the walls with silicone elastomeric roof coating, and paint the roof with NXT heat reflective paint that is NFS rated for catchment. It will be cool as a cucumber once that is performed, and it won't break the bank either. This silicone elastomeric coating is the only one we know of that can be sprayed with a lower end airless sprayer, and it bonds like crazy, so it needs no primer, even on galvanized steel! You can put a loft inside the unit! Look at all the continuous ventilation you have along entire perimeter! The unit is made to go slab on grade, and that’s ok with us, because you can stain and seal the concrete slab inside for a cool looking floor that is super low maintenance and very nice to look at. Throw down some area rugs and you are good to go. Pour a square slab and use the corners to put planters on or whatever you want. Right now, we are working with Sukup to create a unit that can be built on a post and pier foundation also. We are working with homeless providers in Hawaii on a unit that has 10' wall height so the loft can be legal, and 2' overhanging eves. Once that happens, all of our clients can order those units, and we can't wait for their larger unit also! The homeless providers love the fact that the units can be steam cleaned and moved easily, so we are looking forward to help out the state and counties with this bullet proof home! 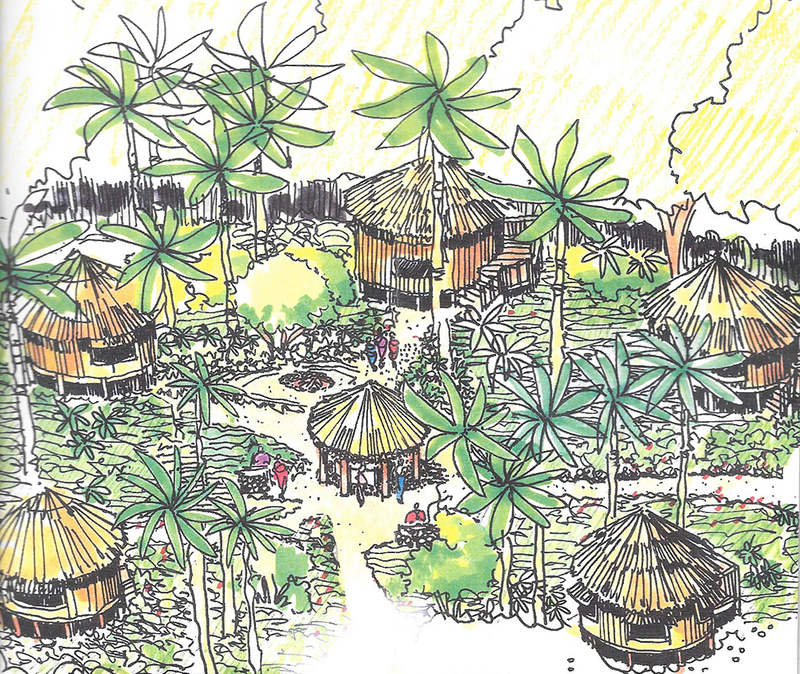 Haiti village designed by Sukup. Their homes were amongst the only homes that survived the hurricane that came after the earthquakes! It’s one tough, legal, and permitted house for a cheap price that is worth considering, especially for those not living in Hawaii year round. We are looking at approx $75 per sq ft for a turn key home (minus grading, catchment tank, septic system and appliances other than oven-stove), or way less if you simply purchase the kit and bolt it together and finish it yourself. 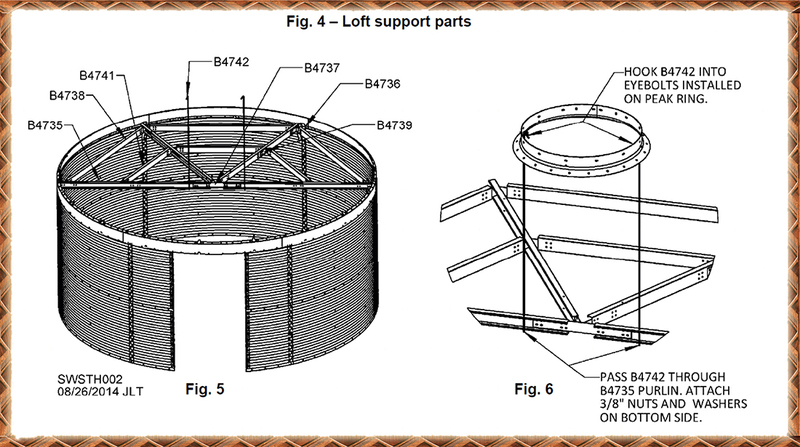 Email us for the pdf instruction manual from the manufacturer. We are figuring out shipping and a cost for the kit, so hang in there for that. We will post the costs here soon. Suffice it to say you can’t find a cheaper small and legal home anywhere near this price. It’s not hard to build yourself, but of course, Hawaii law requires you to hire an electrician and plumber licensed in Hawaii for those jobs. Everything else you can do yourself, and we encourage you to do that. It’s not rocket science. We can do everything for you, of course, and offer comprehensive development services for everything you can imagine to develop your raw land if you wish. Browse this site, there is a ton of useful info you won't find anywhere else!